It was almost Charleston’s grandest church, and now its congregation hangs on to an aging, faded structure that never matched the original design. 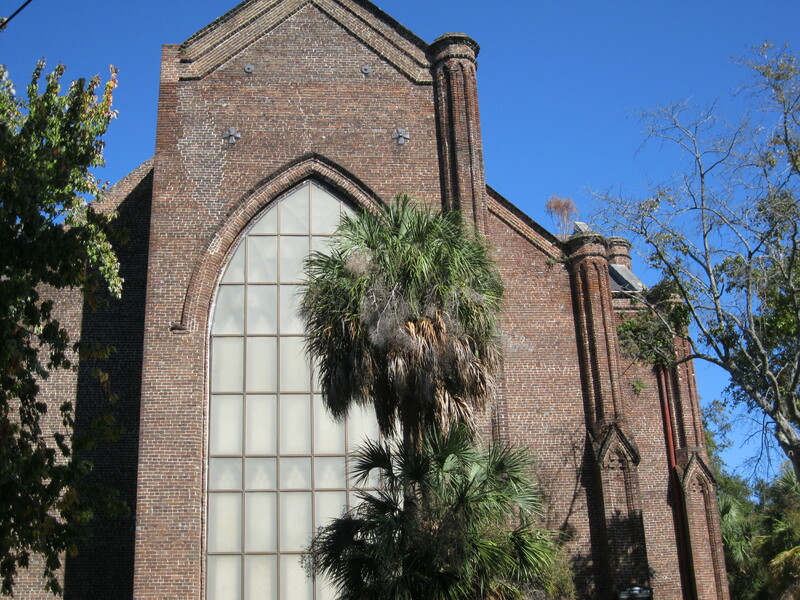 Begun in 1859 as St. Luke’s Episcopal Church on Charlotte Street, the massive Gothic Revival concept of famed Charleston architect Francis D. Lee was to have a 210-foot steeple and stucco facade over exquisite brick details. The church was not finished when the Civil War began, and money intended for its finish details was diverted to the defense of the city, so the spire and stucco never were added. Tabernacle Fourth Baptist Church, a congregation first established by Rev. Daniel Jenkins, who would achieve great fame as creator of the #Jenkins Orphanage Band. One of the most impressive buildings in Charleston is located in one of the city’s most unlikely places – the corner of Coming and Spring streets. 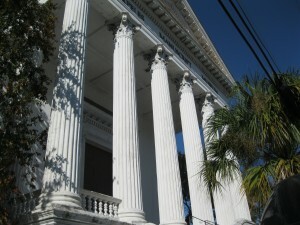 This grand Roman Revival structure towers over the corner atop a high raised basement, with a frontal colonnade of two-story Corinthian columns and a pedimented roof. 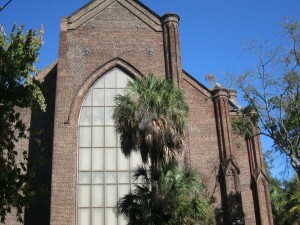 Designed by Charleston architects Barbot and Seyle and opened in 1858 as the Spring Street Methodist Church, the historic building quickly fell on hard times. During the Civil War, it was used as a field hospital for Confederate soldiers, because it was located out of range of the Federal bombarding guns and had a sizeable cistern with plenty of water. When the Confederates evacuated, the Federal occupying troops also used it as a hospital, and carried away anything that wasn’t nailed down as war trophies. Following the Civil War, many inhabitants left the Elliottborough neighborhood, and it became a low-income area as buildings fell into disrepair. The church’s congregation dwindled over the years, and the building was in bad shape after damage from Hurricane Hugo when it was rescued by California philanthropist David Karpeles, who converted it into a manuscript museum. Today, the Karpeles Manuscript Museum is open to the public weekdays, Tuesday-Friday from 11am to 4pm, and features rotating collections of manuscripts and artifacts that may range from Colonial American documents to Egyptian hieroglyphs to Italian opera compositions, and much more. Assistant director Roy Smith is a very affable host for visitors, and has a wealth of knowledge of the building, its displays and the history of Charleston. 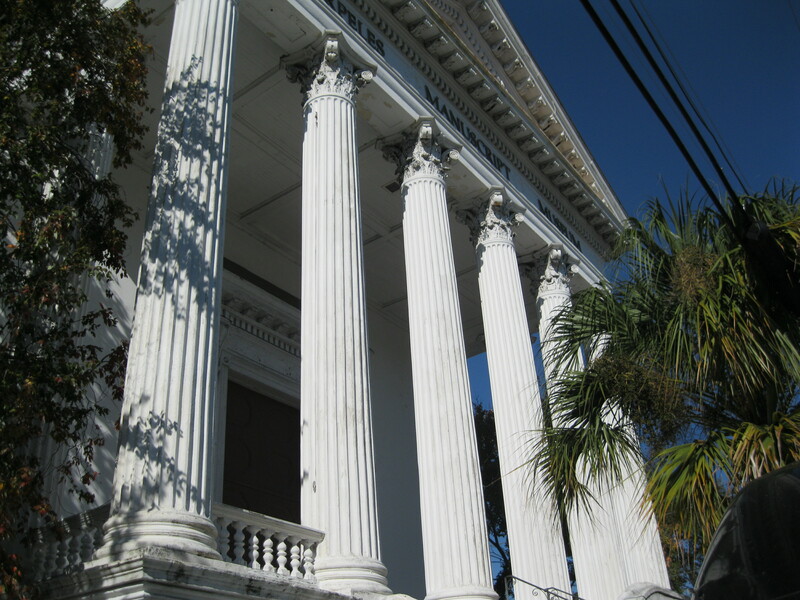 It’s worth a visit just to step up on the grand portico and enjoy this classic structure that has stood through thick and thin here in Charleston. Second Presbyterian Church was completed in 1811 at Meeting Street and Ashmead Place, three years before the current First Presbyterian Church was built at Meeting and Tradd as a replacement for a structure built there in 1734. So in terms of historic rank among the Presbyterian congregations, the Second is the first and the First is the third. Second Prez, as it is commonly referred to, was designed originally with a Georgian-Palladian spire, but the scale of the structure was so massive that money ran out, and all that was built was a tower and lantern section above the enormous two-story portico. Still, the lantern is among the highest church structures in the old city, and built atop a slope whose base stands more than six feet above Meeting Street, Second Presbyterian stands out clearly when viewing the city from the harbor or the Ravenel Bridge. When constructed, the church lay outside the boundaries of the old city in what was then called “The Neck”. Situated equidistant from the city Guard House on Broad Street and the nine ammunition magazine buildings on Laurel Island along the Cooper River in 1827, the Second Presbyterian lantern was put into service for sending signals back and forth in replenishing ordnance and gunpowder from the neck to the city defenses. It was also high enough to be used as a marker for mariners working their way up the Cooper River, and there are references to “Flinn’s Church” in 19th century maritime accounts. According the the 1882 city directory, Second Presbyterian was also known as Flinn’s Church, presumably because of its first pastor, Andrew Flinn. The church is the 4th oldest in historic Charleston, and today adorns the beautiful Mazck-Wraggborough neighborhood north of Calhoun Street, where the streets are wide and quiet, and pleasant walks can be made under giant oaks and among fountains and flowers. 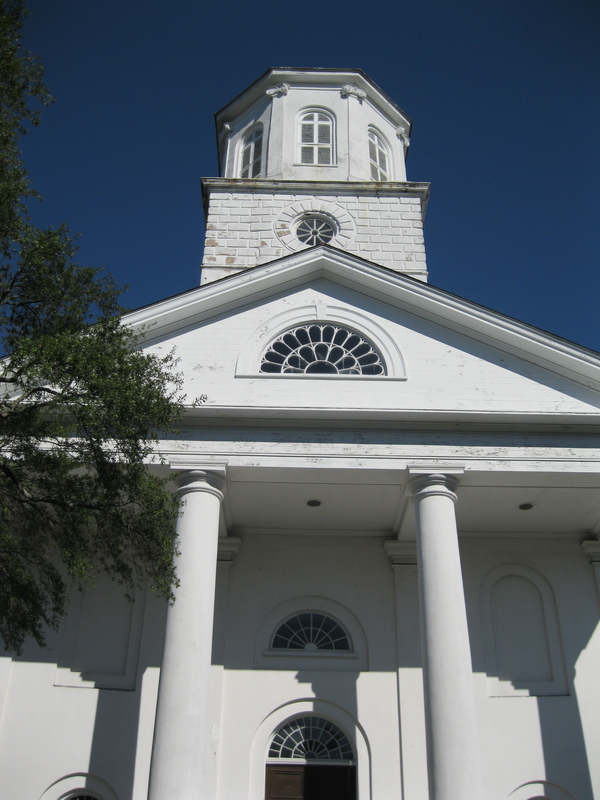 Nearby are the famous Joseph Manigault House and the statuesque Fourth Tabernacle First Baptist Church.